Small environmental cues or changes in one’s environment can make an impact on food choices, and ultimately health. Nudges, or environmental cues such as signage, colors, packaging and product placement, have been identified as factors that influence consumer choice. The Feeding America Nutrition Nudge Research study, conducted by a team of research experts led by Dr. David Just of Cornell University and the Feeding America Community Health and Nutrition team, explored the potential of nudge interventions to increase the distribution of Foods to Encourage (F2E) to clients in a food pantry setting, and to learn food banks’ and food pantries’ perspectives on their operations and service delivery of nutrition education and F2E. Watch Feeding America: Nutrition and Health Strategy "Nudges"
The Foods to Encourage (F2E) framework was designed to describe the nutritional contributions of the food categories in the food banks’ inventories. The Detailed Foods to Encourage framework below serves as the Feeding America national office recommendation, not requirement, for network food banks. Below are the qualifications required for the product categories to be listed within our Foods to Encourage. Does the food pantry have a client choice distribution style? Is there a reliable supply of the food item to be nudged? Is there sufficient client demand for healthier foods? Is there an opportunity to nudge perishable healthy foods? Is the cultural appropriateness of the food or the nudge being taken into account? Is there interest in nutrition education but limited funding available? Are different staff or volunteers within the organization aligned on nudges? Are the organization’s policies supportive of using nudges to move healthy foods? What Makes Nudge Interventions Unique Compared with Other Nutrition Education Programs? Nudges are unique because they are subtle environmental changes in food distribution settings, as opposed to delivering a particular service or good to recipients. Therefore, it is important to keep in mind that a person exposed to a nudge A) may not know one is occurring because nudges are intended to be subtle and, B) does not need to actively choose to participate. Additionally, nudge interventions require a client-choice pantry environment. Finally, nudge interventions can be described as being integrated into a program but are not a program in and of themselves. 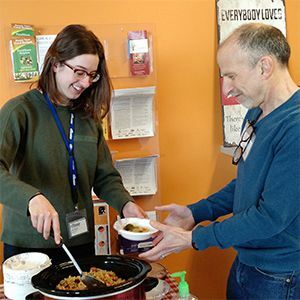 A nudge program would include a broader scope of activities such as coordination and planning between food banks and food pantries for delivery of F2E resources required for nudges.